In order to obtain a real knowledge about the roots of Mangani Language, we had to find out where the facts had taken place. According to Mr. Clayton, 3 de Feb 1909, he said that they were at a Latitude of 10 degrees South, and on the Angola coast approximately (yes, Tarzan was born in Angola), at the African Occidental Coast. The main language in Angola is Portuguese, but it is from this region where many dialects have their roots mainly with the Mbundu and the Mbangala. The extended African language of the region is Bantu. Now, it is true that Mangani is an Ape language, a kind of guttural language (sounds and signals), spoken (and written) by Tarzan (this is our research) and understood but not spoken by Tantor. Bantu is a human language, but in order to find out the supposed roots of Mangani, we had to study the behavior of the beings that lived or live currently in that place. Mangani has an unidentified aspect that is related to the real sound (growl) emitted by an ape, and interpreted by Tarzan, from whom we are really learning. He can speak to the apes in Mangani and practically they understand him, but when they "reply", the emitted sound is interpreted by Tarzan in Mangani. So, learning the "Sounds and Signals of Mangani", it is just another issue. Mangani is not a language composed by onomatopoeic words, as many people might think. There are many sounds and signals as well as words in Mangani. We can learn easily written or spoken Mangani compared to a human language, but not its real sound. We can say to a dog "sit", and he will understand, but interpreting the answer given by the dog in "Doggish language", "Ok, I’ll sit", for us, it is not going to be so easy to understand. The dog can understand the sound that the expression "sit down" means for him, but we don't know if the word "chute" produces the best result to obtain the same answer. In the world of the apes, it was the mental-task of Edgar Rice Burroughs. Suppose that you know many expressions and words of Mangani language and try to ask something to a "chimpanzee" (this word has its origin in Bantu Language.). Well, we are sure that the ape is going to understand you, but when the ape answers back to you, don’t wait for an expression in Mangani as you know. Instead of that, you are going to listen to a strange sound that could seem made of human words. That’s Mangani. A particular situation that we can see is the fact that if we want to speak with apes, we must teach them only in one dialect. All the people of a country speak to apes in a different language such as Spanish, English, French, Italian or even African languages. The fact here is, when the studies of the apes’ dialects become valuable they don’t make Mangani be seen as a fictional language. 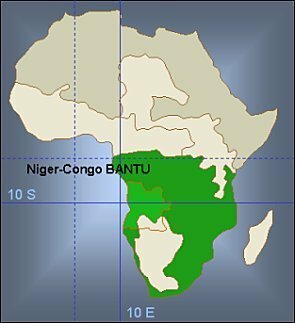 Bantu is a group of languages called by historians Niger-Congo Languages (More than 1400 dialects of this kind of language), spoken by many African families with specific cultural outlines. Among Bantu languages are Basaa, Kako, Chewa, Karanga, Swahili, Shona, Ngumba and Zulu. Some African words that we know in Spanish or English and that make part of our daily speaking are: Banana, Banjo, Bongo, Coffee, Compadre, Comadre, Dengue, Fandango, Ganga, Jumbo, Mambo, Marimba, Merengue, Rumba, Safari, Samba and Zombie. In Palenque, a little African-like town in Colombia, South America, its native language is influenced by Bantu mixed with Spanish and Portuguese. It has a similar shape, function and semantic of the Kikongo and Kimbandu languages. Palenque as a creole language has many words and some of them are used in Spanish too. Some samples of Palenque are: Maluko, Pueblo, Pelé, Kombilesa, Ngala, Kela, Akaba, Buka. (ugly, town, lost, friend, take, stay, finish, find). The great aspect of Bantu languages is the extensive use of affixes. Bantu words are typically made up of open syllables of the CV type (consonant-vowel) with some languages having words exclusively of this type. Of course, we did not have to learn the Bantu protocol, but we could compare the grammar of Mangani with a Bantu language, if we wanted to obtain or understand Mangani, oriented to English but different to any other language in the world. Then, we considered that Mangani is a language of Bantu group, but it is fair to say that Mangani is a Bantu-based Language. The way that we have to pronounce these words is exactly the same way that an English or an American can do. The first aspect that we had to take into account is that there already existed a certain kind of semantic, based on a list of words that we took as reference in order to work in the language grammar. So we had to study carefully each word trying to work out or to solve its root first if it had any; second, the connotation of the word in the context, which means that those words might take its meaning depending on a whole phrase. Third, we always had to observe the few rules that Mangani have in order not to spoil or exaggerate the language. In spite of Mangani having few words, each word, has many equivalent and different words in English. - The use of intensifiers or diminutives as affixes. - Interchangeable position of two words to built another one. - Idiomatic expressions as “Ben-go-utor” as the expression “great-black-fear”. - An interesting way of how to built words by means of two events or objects. - Ability to know the difference between quality and quantity (words like eho and ho). - Ability to know the difference between continuous and discrete (words like eho and ho). - Ability to know the difference between count and non-counts nouns. - Ability to utilize comparatives. They don’t use superlatives. - The great use of adjectives and some adverbs. - Ability to distinguish colors. (researchers said that apes see in gray scale, whereas human do it in colors). - Verbs and nouns are the same word. - Adjective and past participle is the same. - There are not words in past, future, ing - finalized, or representation of these. - There are not articles, pronouns, numbers, conjunctions and - or, and plurals. - There are demonstrative pronouns. - Sentences are short and concise. - There are no verbs conjugations. - There are interrogatives pronouns. - Ability to express aero spatial and orientation concepts. - A good knowledge about of political, geographical and familiar structure. - A good knowledge between evil and kindness. - A good knowledge about men weapons. - A good knowledge about intelligence. 1. Apes emit sounds and signals which are interpreted by Tarzan. 2. Mangani is spoken by Tarzan and understood by apes. 3. Mangani is interpreted with signs and signals by apes and other animals. It was demonstrated at the Washington University that the Broca area of the human brain is gradually activated during the first year of a baby's life. It was identified as the center of the production of the language and it is responsible for the social learning, with an essential role in the language and lecture. Researchers think that during the initial development of the babies, these ones need to play with sounds in the same way as they play with his hands. This helps them to develop a schema in which they establish the relation between the sounds and the mouth movements and tongue. To dominate his abilities, babies have to play such as they will do later to learn how to throw a ball or how to ride on a bike. Babies establish brain connections listening to themselves, linking what they listen to with what they have made to produce the sound. Later, they will use this skill to imitate "people" they listen around. Tarzan used this skill to imitate "apes" they listened around. Sooner or later he would know the difference between the way he "spoke" and theirs because his biological constitution is different from the apes. Apes could learn to identify the way in that Tarzan might speak. Tantor could understand this way of speaking, too. The language makes a human acquire a lot of behaviors and change what he has, without going through "real experiences". They need verbal experiences only. A baby can emit sounds. His many innate verbal expressions have the ingredients that will delimit and sequentially sort out, their form of speaking. From the beginning the adult makes an act of presence. His intervention makes an increment of the infant vocalizations, which satisfies the adult and in consequence to the baby, who will emit more sounds. Biologically the human being is apt to do any activity. During his raising he develops each one of these activities, among them, speaking and writing. Male humans start to pronounce their first words in their first four years of age, while females start in their first three years of age. People start their speaking before learning to write. All in all this has to do with sounds and the relationship of these sounds with each object which they have relation with. The brain is as an empty hard drive of a computer, with a lot of memory, which we must input a great quantity of data. From the moment of the conception, the fetus is exposed to the external environment through the mother, a link that connects it with all kinds of stimuli. In order to explain the "easily" speaking of Tarzan, we could give the example of the young man who has lost his hearing; he cannot hear, but he still can speak, because his vocal chords have not been spoiled and because this, they haven't have lost their functions. If we go back to the beginning of the history of Tarzan, before he became an orphan, he shared the first year of his life with his parents. This was a high class family, with great culture, great manners, and with a lot of very good environment context with positives stimulus. This is why for Tarzan, at the moment of having contact with another human beings, the speaking ability was neither new nor difficult; besides, we must have under consideration that the human being is the only one who has the possibility of pronouncing words by his biological constitution. A parrot can only repeat, it can not use the same process as the human. Besides that, it was discovered that at his 18 years of age, he knew how to write in English, by simple emulation of his book and in relation with the images that were shown on it. But he could not logically pronounce words, because he had been 17 years without listening to them. Cognition is the way that human beings learn, understand life and give solutions to the problems that they come across. Some people have auditory memory and for that reason they learn rapidly when we speak to them -- the information gets across in a verbal way. Other people get it in a visual form -- the written information, the reading and the symbols are easier to assimilate for them. So Tarzan developed these two abilities. On one hand, by his sense of survival that in every human is innate, and on the other hand, by means of the place he was raised in to be able to adapt to his "family, food, basic functions and survivalship". He is a different human in the middle of those wild animals, but accepted and well-respected by his adoptive family. The learning of speaking is learned by imitation. The language is not just speaking, it is essentially, meaning. A word has its worth or importance not for its sound, but through what they symbolize and what they point at instead. Words mean or represent acts of the real world (sensorial meaning), but they mean or produce emotions (emotional meaning). The visual support improves the learning of meanings in the boy. This is one of the reasons why is advisable that an infantile book should be well illustrated. When a word produces an adequate image, the individual has its meaning already. This is the way they learn the meaning of nouns, adjectives, verbs. Once the meaning of several words is mastered, he is able to learn from others, without being in contact with the object (example, searching in the dictionary). Meanings are not word qualities but covered answers, not easy to be seen by human beings. In some lines of the book Tarzan of the Apes, it is shown how the need of culture appears and tends to modify the human behavior -- one of the main differences between animals and humans. "He commenced a systematic search of the cabin; but his attention was soon riveted by the books which seemed to exert a strange and powerful influence over him, so that he could scarce attend to aught else for the lure of the wondrous puzzle which their purpose presented to him." By the time he was seventeen he had learned to read the simple, child's primer and had fully realized the true and wonderful purpose of the little bugs(letters). "No longer did he feel shame for his hairless body or his human features, for now his reason told him that he was of a different race from his wild and hairy companions. He was a M-A-N, they were A-P-E-S, and the little apes which scurried through the forest top were M-O-N-K-E-Y-S. He knew, too, that old Sabor was a L-I-O-N-E-S-S, and Histah a S-N-A-K-E, and Tantor an E-L-E-P-H-A-N-T. And so he learned to read." "The language of the apes had so few words that they could talk but little of what they had seen in the cabin, having no words to accurately describe either the strange people or their belongings, and so, long before Tarzan was old enough to understand, the subject had been forgotten by the tribe." Undeniably, in the animal kingdom, human beings have developed the more elaborate ways of communication. Since earlier times, human has idealized several ways to interchange messages. All kind of animals, from invertebrates to great mammals, communicate among themselves by means of chemical substances, optical signals, tactile signals, movements and sounds. Besides these ways of communication, humans utilize the verbal language. A common way to define the codes of animal communication, is by comparing these with the human language. This is necessary for many reasons, among them, the quantity of existed words, such as the potential to build new ones that will describe any additional number of objects or ideas. Among animals, communication is routed to create “associations” that permit in the last instance, perpetuating the species. Communication means transmission of information. In animal this communication exists as being unconscious of transferring information developed for its own benefit. In the case of apes, the existing communication is established by means of visual signals, sound signals and chemical signals (pheromones). The information interchange of apes, between parents and children, is essentially "calls of warnings" or "calls to eat". Perhaps the word "Tarmangani" came to mean “man”, as they understood, that a man is a "White-Great-Ape", or in a single way "MANGANI". A black man is called "Gomangani", so both are “"Mangani", meaning that Mangani might be a synecdoche, mixing humans with apes. Among carnivorous and apes exists a phenomenon called "meta-communication" which is observed during the situations of game. Among primates, the number of messages is limited, although their power of learning and experiences, in company of their relatives (man), permit a social interaction that becomes more elaborate, that is to say, of imitation. Anthropoids (chimpanzee) have an instinctive behavior which it is an inferior role to the learning, capacity that makes the difference between apes and men. A chimpanzee is endowed with a great capacity for communication. They are noisy in what they do for any reason, whether because they find food, because there are intruders, because the dawn or the sunset, etc. In some cases, the manifestation they present does not have a communicative function, they only exteriorize hanger or restlessness. When they want to communicate with each other, they use pantomime (facial expression), they smile, pay attention, they are happy, sad, etc. However, this does not let us associate the signs or movements, with concretes ideas. Apes are not able to speak, owing to lack of development of the language association areas, located at the left hemisphere of the brain. However, investigation shows that using ASL (American Sign language), utilized by deaf-mute people, permits an interchange of the communication from the chimpanzee to man. In the jungle, this kind of communication is done in the more primitive way and the young learn by imitation of the adults. In the case of gorillas, they have a variety of vocalizations represented in more that 20 different tones, which carry a basic language, but it is not a symbolic or reflexive language. In addition, the cries uttered by wild beasts, chemical signals emited by some animals and the singing of birds, are ways of communication. There are many varieties communication signals between life forms. It depends on what they want to transmit, the distance it has to go over and the habitat of the animals. In case of the apes towards human being, they transmit chemical signals, sound, visual and tactile signals. Chemical signals. Such as received by sense of smell and taste. They can travel big distances when they are carried by air currents. They are transmitted by the air. Sound signals. They can vary thepitch and intensity with speed, and they can transmit a great wide band of information which travels in all directions and the receptor can easily receive them. Visual signals. They act in a small scope, unless they pretend to transmit a lot of specific information. They can be used as calls or can consist of rough movements. Vertebrates have good sight. Tactile signals. Especially in mammals, these signals have a limited reach in order to transmit information, but in many senses, they are the most basic channel of communication, because all living beings respond to physical contact. Vibration signals. They act in short distances. They can indicate presence through different ways, alarm, reproduction and defense. They are especially useful for insects and rodents. Electrical signals. In the case of fish and insects they are utilized for aggression, courtship and orientation. The importance of these systems is based on their similarities and differences with the human language. The human language is characterized by having double-articulation. That is to say, linguistic expressions are built by elements with semantic context (words), that are built on in turn, by elements of a restricted group of sounds (phonemes), that have no meaning by themselves. Communication system signals of animals do not have this kind of structure. Communication system signals of animals produce themselves as a reaction to external stimulus. Animal communication systems are not learned, instead they are completely innate or instinctive. Human language is creative, because it permits the creation of new signals mixing pre-existing elements. This combinatory ability does not exist in animal language. Mangani has special rules describing the grammar of the language because its limited amplitude does not permit the inclusion of grammatical structure as found in English or Spanish. We must understand that Mangani is in great part, a language based on intonations and the "way" it is spoken. These are the rules we must study in order to understand Mangani"
Rule 1. Articles. The Mangani do not use articles. The apes just use the nouns. kalo yud lufo ho wala the cow is beside the village. Rule 2. Conjunctions. The Mangani do not have conjunctions. Instead of "and" they just say the words. Instead of "or" they just say “unk-gogo” at the end of the phrase. Mangani has expressions that work as conjunctions. unk-wala, unk-popo. (go home and go and eat) go home and eat. popo, ud, unk gogo. (eat, drink, speak!) eat or drink, decide! Some adverbs or nouns can be used as conjunctions. See the word guide below. Rule 3. Contractions. Mangani contract similar vowels and similar consonants. *Lus and B’tho. The first refers to the language as a idiom and the organ. The second is only the organ. Rule 4. Numbers. Mangani do not use numbers. They do not need to count anything with precision. They use uncountable nouns. Rule 5.1. Syllabication CASE. In many cases some words obeys an accommodation of the pronunciation. Unk is used to command or emit an order. This is one way to express verbs. unk-lul go to water (bathe!) go and wash yourself! unk-wala go home! go into home! unk-gogo speak! , decide! go and speak! unk-popo eat! go and eat! unk-ugla fight! go and fight! unk-nala go up!, climb! go and climb! unk-ud drink! go and drink! unk-yat look!, see! go and see! unk-yut cut! go and cut it! Even the expression “tand-unk” or “t`unk”, means that you don’t have the order to do something. Barkak - Tarzan-e Where is Tarzan? Rule 5.4 Yud CASE. The term Yud means Appear, Be, Come. Tarzan yud = Tarzan is coming. Tarzan-Be. Tarzan appear. It means “follow” or “be after one”. Barkak - Barkak yud Barkak is following Tarzan. Barkak - Barkak yud Barkak- go- too. ka-unk go because one want. Tarzan can say to an ape, that don’t wet himself because he could get sick. Tarzan – tand-ka-lul. eho-lul, gu-mado. Don’t wet by yourself. Wet, you sick. Jane – ka-gree Love me? Tarzan – ka-gree Love you. gree-ah! Love you so much. Tarzan – Horta bundolo-eta, Tarzan bundolo Horta. If Horta try to attack, then Tarzan will kill Horta. Ape – Tarzan po. Tarzan hungry? Ape – Tarzan po, unk wala, unk popo. If Tarzan hungry, go home and eat. ka-unk popo sopu. You-go to eat some fruit. Tarzan – waugh. You’re right. Barkak – usha-do. Go fast (Do as wind). 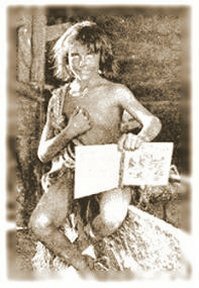 Tarzan – gor-eta Barkak, tand unk. Warn you Barkak, don’t go. Tarzan yud, rem sopu Barkak. Tarzan comes. Bring fruit to Barkak. Barkak – ugh. Barkak akut-do. Ok. Barkak understand (Wise-act). gor-eta to advise (almost growling). gom-eta almost running but not walking. meeta-ah! it is raining so hard! meeta-eta it looks like rain. mee-a to give birth, to produce. Here, eta is used as suffix. This word means “little”. Rule 5.7. Ze CASE. A different between verbs and adjectives in the same context is done with the suffix –ze, with the verb, becoming this an adjective. Rule 5.9. ah CASE. The expression ah, is an intensifier, it is not a superlative. Rule 7. Pronouns. The Mangani do not use pronouns. Instead they just use the nouns and make hand motions. Instead of I, they just say their name. Instead of you, singular or plural, they just say the person’s name or point. Instead of he, she, or they, they use the person’s name or point in whichever direction the person is. Instead of here and there, they just point down or in the direction of the place they are referring to. Spkr - rem sopu. I bring fruit. Spkr - Spkr, rem sopu. I, Spkr, bring fruit. Spkr - (pointing to him, Lstr) rem sopu. You, Lstr, bring fruit. Spkr - Lstr, unk rem sopu! You, Lstr, go and bring fruit! Spkr - Othr, rem sopu. He, Othr, brings fruit. Spkr – meea sopu. It produces fruit. Spkr - (hand in chest, later pointing) rem sopu! We bring fruit. Spkr - (pointing to them) rem sopu! You bring fruit! Spkr - (pointing to them) rem sopu! They bring fruit! Mu (She) and Bu (he) are adjectives or nouns, i.e. a he or a she, as in the English She-Cat. Rule 8. Demonstrative adjectives. Indicates distance or location of the noun with respect to the speaker. wo wala yud zu (this house be big) this house is big. wob sord tarmangani gogo nur that bad tarmangani tells lies. wob kalo yud lufo ho wala that cow is beside the village. Ape – Barkak- unk-wala, unk-Tarzan. Barkak go home, with Tarzan. Tarzan - Tarzan tand-unk wala. Tarzan no go home. Ape – Tarzan rem pisah. Tarzan fish? Tarzan – Tarzan tand-rem pisah. Tarzan no fish. Ape - Unk-yat, zu-horta-lu. Look!, big-Horta-fierce. Ape - Gugu zu den, lufo gom-lul. In front of big tree, close to river. Tarzan - Kreeg-horta, eho-da zutho. Danger Horta, force in big mouth. Ape - Tarzan utor. Tarzan frightened? Tarzan bundolo Horta. Tarzan will kill Horta. There is no words in past. In order to build sentences in past is locating some expressions before the whole phrase. It indicates that the speaker is going to say something that happen some days or nights ago. Rand (back) is used as “Ago”, just like in English, at the end of the expression. Many-years-ago = Ho-ho a - rand. Ho-goro-rand, eho-kando-lu lana zee ul Tarzan. Tarzan balu-den bund ho-kando. Ga-b’yat kando. Many nights ago, a lot of fierce ants stung the leg of Tarzan. Tarzan with a stick killed many ants. They were red-head ants. Ho-kudu-rand, Tarzan ry-balu-den etarad bundolo-eta sheeta. Meeta tand-bund sheeta. Many suns ago, Tarzan with his bow and arrow, tried to kill sheeta, but Meeta avoided it. Ho-a-rand, Tarzan b’wang gash yut-o un ul Bara. Bara bund. Many days ago, Tarzan with knife in hand, stab the loin of Bara. Bara died. A verb or a noun can be used as adverb or adjective, not being this always an exact rule. Build sentences with the less number of words. Omit words that does not change the meaning or idea of the sentence. Because it does not have an only way to build sentences, following these rules and cases, that helps you to avoid the bad use of Mangani language. Read the examples to understand more Mangani grammar. To build a sentence, find out the word in Mangani and read all the meanings to understand the real meaning of the word. Always remember that a word in Mangani has a lot of meanings in English. Here there some expressions or sentences in order to know how Mangani is spoken or written. you are right! ben go utor! don’t speak, but shut up! this nest be bigger than that one. Adjectives, Past Participle, Adverbs, Conjunctions, Determinatives Adjectives, Prepositions, Interrogative pronouns. The words in this dictionary come from six sources. The first source is the Tarzan novels themselves. The second is the Pal-ul-don glossary from Tarzan the Terrible. Pal-ul-don words have been excluded. The third is Thomas McGeehan’s compilation, which was originally published in ERB-dom (October 1962), and reprinted in Robert W. Fenton’s The Big Swingers (Englewood Cliffs, NJ: Prentice-Hall, 1967). McGeehan added words from Tarzan comic books to Burroughs’ original list. The fourth source is Whatsits Galore's dictionary. The fifth is Philip Jose Farmer’s Tarzan novel The Dark Heart of Time. The sixth is the Tarzan graphic novel from Dark Horse Comics, Tarzan: Love, Lies, and the Lost City. Dr. Peter Coogan has deduced the meaning of many of the words himself by studying them intently. Additionally, Wold-Newton scholars Matthew Baugh and Brad Mengel have deduced many translations as well. I have deduced the meaning of the rest of words, thanks to the kind support of Dr. Pete Coogan who offered me his work as open source work. I decided to complete this dictionary in this way, because I had always wanted to know the meanings of those words since I was a child. I "looked at" the comic books but never understood. Today I don’t know why I can understand them. I think my specialization in Computer Science and knowledge of Virtual Simulation opened the opportunity to "discover the arrangement of words in alphabetical order, so I delighted in searching for and finding the combinations with which I was familiar, and the words which followed them, their definitions. This led me still further into the mazes of Mangani erudition." Thanks to my wife Dra. Adriana Garavito, who helped me to know some animals aspects and their lives, and Dra. Johanna Ramón for the psychological accreditation of the Tarzan learning explained here. Tarzan of the Apes. © by Edgar Rice Burroughs. Enciclopedia SALVAT. Felix Rodríguez de la Fuente. Comunicación Animal. Definición. Wikipedia, Wikimedia Foundation Inc.
www.solociencia.com © 2003 - 2007 Lexur - La práctica construye conexiones cerebrales para el aprendizaje del habla en los bebés. © Tarzan by Edgar Rice Burroughs. All Rights Reserved.